“How do the oceans work?” Essentials of Oceanography, Eleventh Edition, takes an interdisciplinary approach to help students answer this question. The latest edition brings together the interrelated spheres that compose Earth's systems as they relate to the oceans: geological, chemical, physical, and biological. 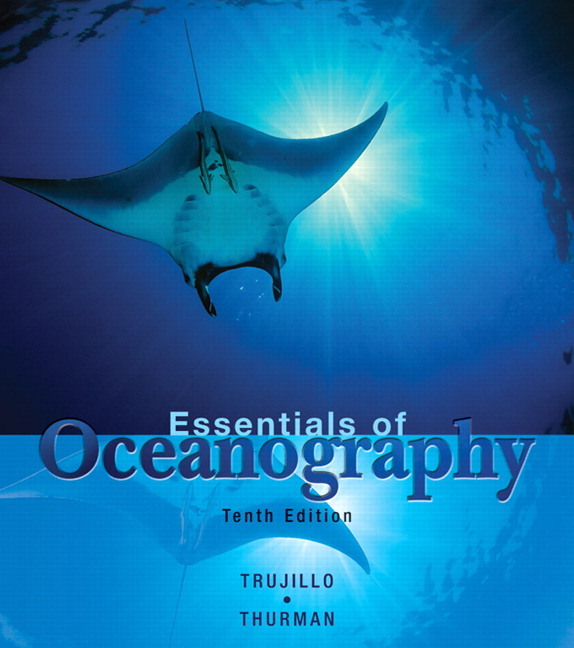 Trujillo and Thurman balance rigor and accessibility, combining in-depth discussions of oceanographic concepts with highly visual and interactive study aids to demystify the science for the non-science student. This unique combination has made Essentials of Oceanography the best-selling brief book—and one of the best-sellers overall—in oceanography. Accessible language demystifies scientific terms by introducing each new term with its etymon (the true sense of a word) and helps maintain accessible rigor and depth of material, particularly in the coverage of tides and biological processes. Discussion of The Oceans and Climate Change (Ch. 16) includes detailed coverage of greenhouse gases and the unintended and severe changes in the ocean, such ocean warming, more intense hurricanes, increasing ocean acidity, changes in deep-water circulation, melting of polar ice, and rising sea level, and how action must be taken to reduce human-caused greenhouse gases. Historical Features focus on historical developments in oceanography that tie into chapter topics. Research Methods in Oceanography highlights how oceanographic knowledge is obtained. Oceans and People examines the interaction of humans and the ocean environment. Focus on the Environment emphasizes environmental issues, which are an increasingly important component of the book. End-of-chapter questions and exercises help students self-check their understanding. Link the narrative to state-of-the art computer animations created by Al Trujillo and a panel of geoscience educators. Help students visualize some of the most challenging oceanographic concepts. Demonstrate animations of topics including Formation of Seamounts/Tablemounts and Stages of Coral Reef Development; How Calcareous Ooze Can Be Found Beneath the Calcite Compensation Depth (CCD); Ekman Spiral and Coastal Upwelling/Downwelling; Interference Patterns in Waves; The Deep Scattering Layer (DSL). Key terms, noted in bold print, are defined when introduced and are included in the glossary. Learning Outcomes are stated for each chapter to help frame student learning and supported by Essential Concepts, whichprovide a roadmap to each chapter’s key elements. In-chapter assessment questions end each section of the chapter with NEW! Concept Check questions. These questions ask the students to stop and make sure they understood the Essential Concepts of the section before continuing to read the chapter. These questions cover all levels of Blooms Taxonomy and escalate in complexity, including summation questions that ask students to critically analyze the concepts being discussed. Essential Concepts Review is the end-of-chapter review, now numerically correlated to each Essential Concept within the chapter to simplify the study process. This visual summary contains a review of the concept, the key figure, study resources available to the student, and a Critical Thinking Question. 50+ NEW! Figures, including modern, more realistic illustrations of marine life, make oceanographic topics more accessible and easier to visualize. Alan P. Trujillo teaches at Palomar Community College in San Marcos, CA, where he is co-Director of the Oceanography Program and Chair of the Earth Sciences Department. He received his bachelor’s degree in geology from the University of California at Davis and his master’s degree in geology from Northern Arizona University, afterwards working for several years in industry as a development geologist, hydrogeologist, and computer specialist. Al began teaching in the Earth Sciences Department at Palomar in 1990 and in 1997 was awarded Palomar’s Distinguished Faculty Award for Excellence in Teaching. He has co-authored Introductory Oceanography with Hal Thurman and is a contributing author for the textbooks Earth and Earth Science. In addition to writing and teaching, Al works as a naturalist and lecturer aboard natural history expedition vessels in Alaska and the Sea of Cortez/Baja California. His research interests include beach processes, sea cliff erosion, and computer applications in oceanography. Al and his wife, Sandy, have two children, Karl and Eva. Harold V. Thurman retired in May 1994, after 24 years of teaching in the Earth Sciences Department of Mt. San Antonio College in Walnut, California. Interest in geology led to a bachelor’s degree from Oklahoma A&M University, followed by seven years working as a petroleum geologist, mainly in the Gulf of Mexico, where his interest in oceans developed. He earned a master’s degree from California State University at Los Angeles and then joined the Earth sciences faculty at Mt. San Antonio College. 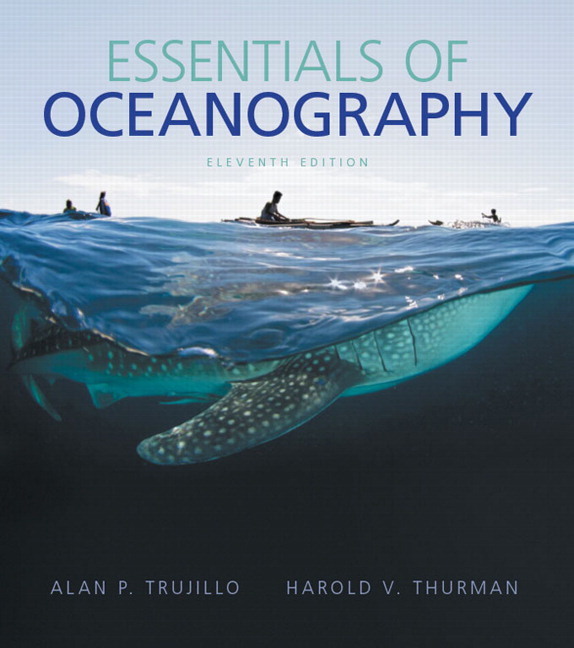 Other books that Hal has co-authored include Introductory Oceanography (with Alan Trujillo) and a marine biology textbook. He has also written articles on the Pacific, Atlantic, Indian, and Arctic Oceans for the 1994 edition of World Book Encyclopedia and served as a consultant on the National Geographic publication Realms of the Sea. He still enjoys going to sea on vacations with his wife Iantha.